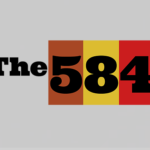 The 584 is the working art and design studio and gallery of owner, resident artist and curator Michelle Gonzalez-Green. Several times a year, the gallery is open to the public for exhibits and events featuring other artists. All happenings at The584 are intended to be in the spirit of a multicultural creative community led by people of color, but open to all. The name The584 is in honor of Michelle’s mother, grandmother and aunts, who are all now ancestors. It is the building number where her grandma called home in the South Bronx for 57 years.